By and large, Americans trust the news they hear from the most well-known organizations. But a new Pew Research Center report on political polarization and media habits finds that a significant number of web-using adults get at least some of their news about government and politics from sources that they distrust – a concept that may seem puzzling. This is in line with our other findings about trust in the news, as conservatives tend to distrust more news sources than liberals do. Of the 36 news sources we asked about, on balance, consistent conservatives distrust more than trust 24 of them, whereas 28 are trusted more than distrusted among consistent liberals. In the end, for consistent conservatives, there is a smaller pool of trusted news outlets to choose from (among these 36). 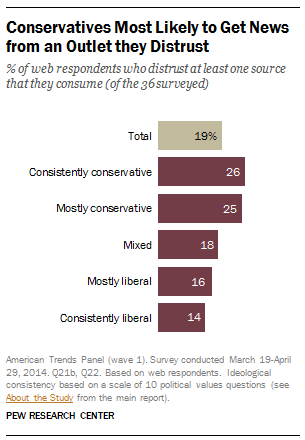 To be sure, the most common top sources on both the right and the left also tend to be the most trusted sources. The report finds that almost half (47%) of respondents with consistently conservative political views name Fox News as their main news source, a news organization they also overwhelmingly trust. Respondents with consistently liberal political views are less unified in their use of a single news source, with no more than 15% citing CNN, NPR, MSNBC and the New York Times as their main go-to — and all four outlets are widely trusted among consistent liberals. Some of the news organizations that consistent conservatives distrust, yet still get their news from, are the major broadcast television networks. Among consistent conservatives, 14% distrust but also consume at least one of these networks – ABC News (10%), CBS News (7%) and/or NBC News (7%). This compares with only 2% of those with consistently liberal political values. Finally, there are a fair amount of respondents who get news from sources that they do not particularly feel strongly about one way or the other. 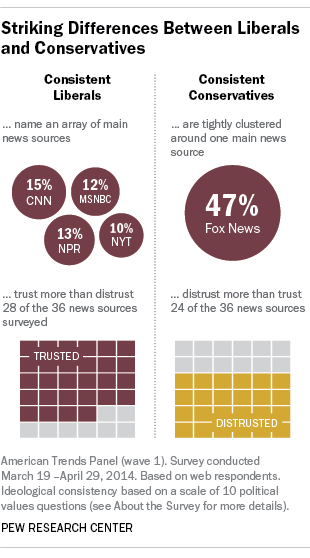 Nearly four-in-ten (39%) respondents get news from at least one outlet that they neither trust nor distrust.